Adjust oven racks to top and lowest positions and heat oven to 500 degrees. Arrange potatoes on rimmed baking sheet, pour ¾ cup water into baking sheet, and wrap tightly with aluminum fol. Cook on lowest rack until paring knife or skewer slips in and out of potatoes easily (poke through foil to test), 25 to 30 minutes. Removed foil and let cool for 10 minutes. If any water remains on baking sheet, blot dry with paper towel. Drizzle 3 tablespoons oil over potatoes and roll to coat. 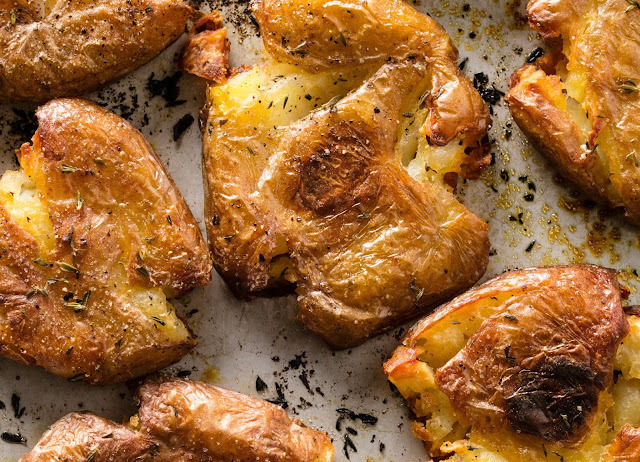 Space potatoes evenly on baking sheet and place second baking sheet on top; press down firmly on baking sheet, sprinkle with thyme and season generously with salt and pepper; drizzle evenly with remaining 3 tablespoons oil. Roast potatoes on top rack for 15 minutes. Transfer potatoes to lowest rack and continue to roast until well browned, 20 to 30 minutes longer. Serve immediately. End. After rolling cooled, oven steamed potatoes in olive oil space them evenly on a baking sheet and place a second baking sheet on top; press down uniformly on the baking sheet until the potatoes are 1/3 to ½ inch thick. Sprinkle the smashed potatoes with thyme, season with salt and pepper and drizzle evenly with the remaining oil. Roast as directed.